Shrewsbury Town midfielder Junior Brown admits it is now "back to the bread and butter" of a League One relegation battle following their FA Cup fifth-round tilt at Manchester United. Following Monday night's deflating 3-0 home defeat by the 11-times winners, Shrewsbury must now head for bottom club Colchester United this Saturday. But Brown insists that Shrewsbury can feel inspired by their midweek efforts. "If we can play like that week in, week out, we'll be fine," he told BBC Sport. "We acquitted ourselves well overall. We had the opportunity to test against the best. And it's given us something to build on for the rest of the season, given the position we're in in the league. "It's been a great FA Cup run and we got our just desserts getting the tie we did. But it's time to focus on the league again now and get back to the bread and butter." Shrewsbury's FA Cup preoccupation last weekend caused them to drop back into the League One relegation zone, following Chesterfield's 3-1 win at home to another of the relegation-threatened sides Crewe. Town defender Zak Whitbread sees their final 15 games as being "15 cup finals" for a Shrewsbury side who have not won at home in the league since 24 October. But their away form has sustained them in that time, having clocked up away wins at Sheffield United, Crewe, Burton Albion and Blackpool. They now face a run of five out of their next six fixtures all being against sides currently in the bottom half of the league. The Town can also now call on reinforcements to bolster their squad in Essex, cup-tied pair Richie Wellens and Kyle Vassell, while boss Micky Mellon will have to assess midfielder James Wallace's knee injury. Junior Brown was talking to BBC Radio Shropshire sports editor James Bond. Should Mata's free-kick have stood? 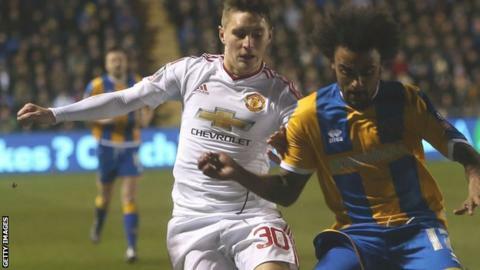 Read more on FA Cup: Shrewsbury v Man Utd: Should Mata's free-kick have stood?